Stone Circle in Pembrokeshire. 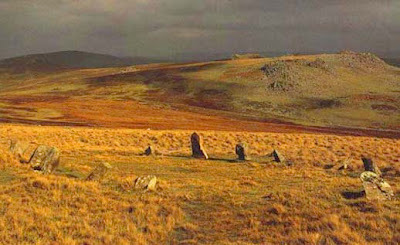 This so-called stone circle lies overlooking the Bluestones outcrop of Carn Meini. It is actually oval or horse-shoe shaped leading to speculation that it may have been this site which influenced the original horseshoe of Bluestones at Stonehenge. Translated as 'The Grave of Arthur', it comprises thirteen small standing stones along with two or three more now fallen. Some believe it may be a henge - as it lies adjacent to the ancient trackway which runs to Carn Meini (and then on to the hillfort of Foel Drygarn) this would make sense. Access is via this ancient trackway (now a public footpath) with a reasonably gentle walk over from Carn Meini. The prehistoric site of Bedd Arthur, (Arthur’s Grave) lies on a hillside, across the valley from the infamous Carn Menyn. Some call it an oval stone circle, some see it more as two parallel stone lines, closed at one end. It has even been suggested that its horseshoe shape was the inspiration for the innermost circle at Stonehenge. The bluestones used for the inner circles were from Carn Menyn just across the valley, and skeletons of men found at Stonehenge have been traced to this area, who knows. One thing is for sure, whatever its significance and purpose to our ancestors, Bedd Arthur is an exceptionally enigmatic and tranquil site today. But not much use for shelter.